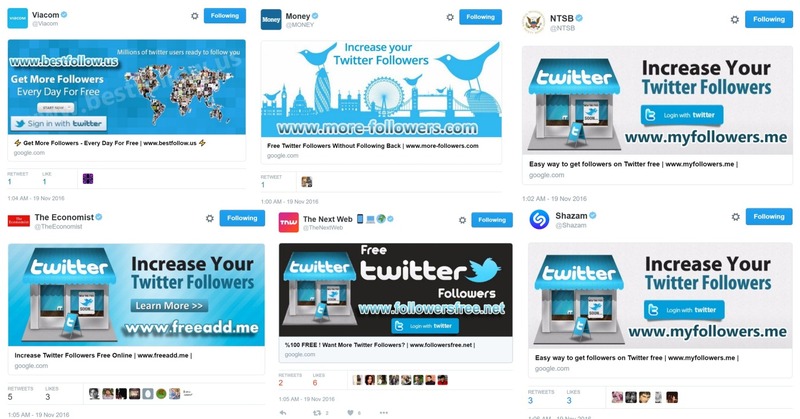 A number of popular Twitter accounts suddenly wanted to help you add more followers. If you noticed something odd on Twitter tonight, you weren't alone. Around 1AM ET, accounts like @PlayStation, @Viacom, @XboxSupport, @NTSB, @TheNewYorker, @TheNextWeb, the Red Cross (@ICRC) and @Money started aggressively pushing ways to help you obtain more followers for free. Most of the tweets have been scrubbed, however, a look at Tweetdeck revealed they were all posted via Twitter Counter (@thecounter). It's unclear exactly what happened, however, reached by email, Boris Veldhuijzen van Zanten said the company is looking into the situation. According to its website, Twitter Counter "provides statistics of Twitter usage and tracks over 14 million users...and sells featured spots on its website to people who want to gain more followers." If it was hacked, the problem only appears to have hit accounts linked to the tool, so your account is probably safe. Still, as always, now is a good time to reset your password, and double check any apps or services linked to your social media accounts -- if they get compromised, you do too. Update: Twitter Counter tweeted confirming the hack, and says the attackers are no longer able to post via its customer's accounts. We can confirm that our service has been hacked; allowing posts on behalf of our users! We have launched an investigation into this matter. As of now, the hackers CANNOT post on our users' behalf anymore. We will keep you posted on any other updates!